Since "birthdays" is currently winning the "when do you send cards" poll, I decided to sort through my photos for things that I could make into birthday cards. 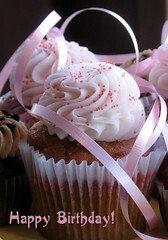 While many of my flower and butterfly photos are excellent for birthdays, cupcakes seem especially appropriate. I already make some stamped cupcake cards (a couple of which I've given for birthdays myself). While the stamped cards are adorably cute, I think these photo cards are going to be mouth-watering. It's too late to run to the photo shop today though, so these cards probably won't come into existence until Friday. For now, you can take a look at my Papery set for the photos that I'll be using.